Rotherham have been promoted to the Championship after beating Shrewsbury 2-1 after extra time in the League One play-off final at Wembley. Former Wigan defender Juan Carlos Garcia has died at the age of 29 following a battle with leukaemia, the League One club have announced. Garcia had been diagnosed with the illness in early 2015 and remained in England until returning to his native Honduras towards the end of last year. He had joined Latics from Olimpia on a three-year contract in 2013, following the path previously taken by fellow Honduras internationals Maynor Figueroa, Wilson Palacios and Hendry Thomas. Though he would make just one appearance for Latics, against Manchester City in the League Cup, he featured in two of his country's games at the 2014 World Cup. Wigan chairman David Sharpe said on wiganathletic.com: "This is such tragic news and we send our deepest condolences as a club to Juan Carlos' family and friends who have had to sit by and watch this sad story unfold over the past few years. "We have offered what support we can but, despite the best possible treatment at Christie's Hospital, Juan Carlos has tragically not been able to beat this terrible illness. "At just 29 years old, he was far too young to be taken and our thoughts are with his family at this sad time." Wigan will hold a one minute silence for Garcia prior to Saturday's fixture with Peterborough. The Seasiders confirmed the decision in a statement on Friday afternoon. A 3-2 win for Fleetwood kept Bolton's champagne on ice as a pitch invasion halted the Trotters' match against Port Vale. Fleetwood kept the heat on Bolton in the League One automatic promotion race, while Chesterfield's relegation was confirmed. Several teams could today seal a play-off spot, be facing relegation or move closer to promotion throughout the Football League. Sheffield United have been confirmed as champions of League One after 10-man Oldham Athletic beat Bolton Wanderers on Saturday. 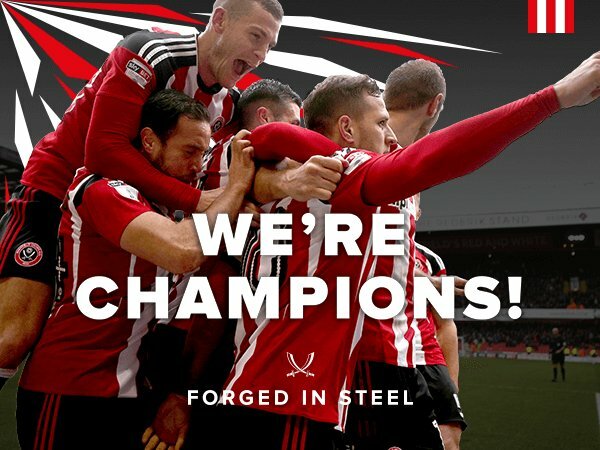 Champions-elect Sheffield United moved another step closer to a return to the Championship with a 2-1 win over Charlton.